Hot watch list for biotech microcap (comments). Inovio is developing a new generation of vaccines, called DNA vaccines, to treat and prevent cancers and infectious diseases. These SynCon™ vaccines are designed to provide broad cross-strain protection against known as well as newly emergent strains of pathogens such as influenza. These vaccines, in combination with Inovio's proprietary electroporation delivery devices, have been shown to be safe and generate significant immune responses. Inovio's clinical programs include three separate programs in Phase II clinical studies, including VGX-3100 for treating cervical dysplasia and cancer. Other Inovio clinical programs include those for avian flu (preventive) and HIV vaccines (both preventive and therapeutic). Inovio is developing universal influenza and other vaccines in collaboration with scientists from the University of Pennsylvania. Other partners and collaborators include Merck, ChronTech, National Cancer Institute, U.S. Military HIV Research Program, NIH, HIV Vaccines Trial Network, University of Southampton, and PATH Malaria Vaccine Initiative. More information is available at www.inovio.com. During 2010, Inovio announced it achieved best-in-class immune responses in its Phase I dose escalation study of VGX-3100, its DNA vaccine to treat pre-cancerous cervical dysplasias and cancers caused by human papillomavirus (HPV) types 16 and 18. All dose groups developed significant antibody and T-cell immune responses; notably, in the third and final dose group, five of six (83%) patients developed unprecedented T-cell responses not achieved by any other non-replicating vaccine platform in humans. VGX-3100 delivered using Inovio's proprietary CELLECTRA® intramuscular electroporation delivery device was generally safe and well tolerated at all dose levels. There were no vaccine-related serious adverse events; reported adverse events and injection site reactions were mild to moderate and required no treatment. 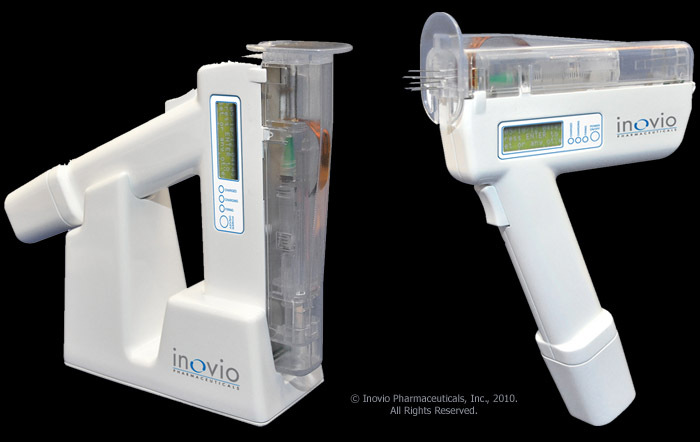 Subsequent to year end, Inovio initiated a Phase II clinical trial for VGX-3100. The study will assess adult females with CIN 2/3 or CIN 3, the pre-cancerous stages of abnormal cells that precede cervical cancer, and biopsy-proven HPV 16 or 18, which are responsible for 70% of CIN 2/3 and cervical cancer incidences. The randomized, placebo-controlled, double-blind study will evaluate cervical tissue changes after three 6 mg doses of VGX-3100 are administered by injection in combination with Inovio's CELLECTRA® electroporation delivery device. The company expects that a total of 148 patients will be enrolled in 25 study centers in the U.S., South Korea, South Africa, Australia, and Canada. During 2010, Inovio observed in an interim analysis high vaccine-induced response rates and strong magnitude of immune responses in its Phase I clinical study of PENNVAX™-B, a DNA vaccine for the prevention of HIV infection. A Phase I study, called RV262, began to evaluate a unique prime-boost preventive HIV vaccination strategy aimed at global coverage. The prime is Inovio's plasmid DNA vaccine, PENNVAXTM-G. The NIAID, part of the U.S. National Institutes of Health (NIH), is sponsoring the study, which is being conducted by the U.S. Military HIV Research Program (MHRP) through its clinical research network in the U.S. and east Africa. The company launched a U.S. Phase I clinical trial to evaluate its SynCon™ H5N1 (avian) influenza DNA vaccine, VGX-3400X, using intramuscular electroporation delivery. ThisH5N1 vaccine study represents the first step in demonstrating Inovio's novel universal influenza vaccine approach, which aims to bypass the current requirement for annual strain and subtype-specific influenza vaccines by developing a single vaccine to potentially protect against all strains within multiple targeted subtypes, such as H5N1 and H1N1, posing risk to humans. Inovio's affiliate, VGX International, also initiated a phase I clinical study of this vaccine candidate in Korea. Subsequent to year end, Inovio's collaborator the University of Southampton initiated a Phase 2 clinical trial (WIN Trial) to treat leukemia utilizing Inovio's new ELGEN 1000 automated vaccine delivery device. This open-label, multi-center clinical trial is evaluating a DNA vaccine to treat chronic myeloid leukemia and acute myeloid leukemia. Another partner, ChronTech Pharma AB,initiated a Phase IIb clinical study of its ChronVac-C® DNA vaccine for hepatitis C virus (HCV) delivered by Inovio's proprietary electroporation DNA vaccine delivery technology in combination with standard of care. In a Phase I clinical trial of ChronVac-C using Inovio's MedPulser® electroporation device the therapy resulted in a robust increase in T-cell immune responses against HCV and was safe and well-tolerated. Post-study observation of subjects who completed the protocol and then entered into standard of care (SOC) treatment using interferon and ribavirin showed a complete and rapid viral response (four weeks) in 70% of those participants (5 of 7 patients). More significantly,83% of the participants (5 of 6 patients) who were monitored for an extended period of time continued to show undetectable virus levels six months after they completed SOC. SOC treatment alone usually results in about 40-50% of patients reaching undetectable virus levels after six months of treatment. A new generation of vaccine, called DNA vaccines, displays the potential to meet these goals. There is promising evidence that delivering this next generation of vaccines using technology based on the science of electroporation may provide a unique path to safely and effectively address an array of diseases. * Preventive AND therapeutic capabilities. * Vaccine. A fragment of DNA designed to produce an antigenic protein related to a particular disease is injected into the body. If sufficient quantity of the DNA can be inserted into cells, the cells will produce the antigenic protein and may trigger the desired antibody and T-cell immune response. As a therapeutic vaccine, the aim is to induce the immune system to kill existing cells infected with the associated infectious disease or to kill cancerous cells. As a preventive vaccine, the aim is to have the immune system retain memory of the antigen to provide future protection against the disease. The challenge and opportunity is to refine immune system targets of the vaccine to elicit a clinically relevant immune response. * Delivery method. Scientists have been experimenting with different approaches to deliver DNA vaccines into cells of the body in order to produce the intended antigenic proteins. Advancement of the field has been hindered by the lack of a safe, efficient, and cost effective DNA delivery method. The challenge and opportunity is to refine a delivery method capable of enabling the desired immune response without inducing an unwanted immune response against the vaccine or the delivery method itself, and without producing other toxicity. * Adjuvants. Many protein antigens are poorly recognized by the immune system without the addition of compounds that can help set up an environment for such recognition. Adjuvants typically create a "danger signal" to the immune system, helping the body distinguish those targets to which antibodies and T-cells should be directed. Inovio's unique expertise, technology and patents are well-positioned to achieve potential breakthroughs in the development of new vaccines. Inovio Pharmaceuticals's management and scientists together possess many decades of broad vaccine and, specifically, DNA vaccine expertise. Their individual and collaborative efforts have contributed significantly to expanding the boundaries of vaccine science. Inovio is a leader in electroporation-delivered DNA vaccines and possesses unique development expertise and proprietary technology and patents in the areas of DNA vaccine design, formulation, and delivery, with related manufacturing expertise as well. The company's novel SynCon™ DNA vaccine construct technology enables the development of DNA vaccines better able to address changing strains of diseases such as HIV, HCV, HPV, and influenza. Inovio's R&D team has been able to repeatedly translate candidate vaccines, from "bench to IND filing" within one year. Inovio has a broad pipeline of proprietary preclinical and clinical-stage DNA vaccines. The company's proprietary electroporation-based DNA delivery technology has shown promise to enhance the potency of preventive and therapeutic vaccines against cancers and chronic infectious diseases. Current partners using the company's electroporation delivery technology include vaccine giant Merck; biotech companies; as well as government and non-government agencies such as the HIV Vaccine Trials Network, National Cancer Institute, and International AIDS Vaccine Initiative. * Infectious disease vaccines: HIV, hepatitis C, influenza, bioterrorism targets. then apply high-voltage electric pulses at the injection site (I'm not sure that it's painless procedure because to electroporate cell membrane kV voltage is needed). DNA penetrates in muscle cells and cells start to produce DNA-coded protein (or peptide). Since this protein is allogenic T-cells will be activated i.e. immune response will be induced. In simple words INO is transfected muscle cells inside human body (see below). Conclusion: INO technology is unique and innovative. It seems like this approach is effective to induce an immune response for cancer and viral antigens. BTW this method is may be cheapest in comparison with other immunization approaches (DNDN, AGEN, CLDX and ONTY). Main question: Is this method effective? Is INO a new Dendreon? Only time will tell. Disclosure: I don't have INO positions now. This company has strong science basis and big pharma like Merck already making circles around INO. So, INO is a perfect target for long-term investment (3-5 years). October 10, 2011 (PR NewsWire) Inovio Pharmaceuticals, Inc. (NYSE Amex: INO), a leader in the development of synthetic vaccines against cancers and infectious diseases, announced today that it has entered into a product development collaboration agreement with its affiliate, VGX International Inc. (KSE:011000), to co-develop Inovio's SynCon® therapeutic vaccines for hepatitis B and C infections. Under the terms of the agreement, VGX International will receive marketing rights for these vaccines in Asia, excluding Japan, and in return will fully fund IND-enabling and initial phase I and II clinical studies. Inovio will receive payments based on the achievement of clinical milestones and royalties based on sales in the licensed territories and retains all commercial rights in all other territories. The first product to enter clinical testing will be a synthetic multi-antigen hepatitis C virus (HCV) vaccine covering genotypes 1a and 1b and targeting the antigens NS3/4A, which includes HCV nonstructural proteins 3 (NS3) and 4A (NS4A), as well as NS4B and NS5A proteins. The vaccine will be delivered with Inovio's CELLECTRA® delivery device. IND-enabling toxicology tests will be conducted in 1H 2012, with the intent being to initiate a phase I clinical study in late 2012. The target population for the vaccine clinical trials will be HCV infected individuals. Supporting this product development advancement are positive preclinical results from Inovio's novel SynCon® vaccine targeting NS3/4A, which were published in the journal Molecular Therapy in the paper, "Hepatitis C Virus NS3/NS4A DNA Vaccine Induces Multi-epitope T Cell Responses in Rhesus Macaques Mimicking Human Immune Responses." Following immunization, rhesus macaques mounted strong HCV-specific T cell immune responses strikingly similar to those reported in patients who have cleared the virus on their own. The responses included strong NS3-specific interferon- (IFN-) induction, robust CD4 and CD8 T cell proliferation, and induction of polyfunctional T cells. The study was funded in part by a $2.8 million PA CURE grant received by Inovio and its collaborators in 2010 to develop this multi-antigen synthetic HCV vaccine. So we have an accumulation here even when INO pps is declining during last 6 months. Disclosure: I have INO positions. BLUE BELL, Pa., Feb. 22, 2012 /PRNewswire/ -- Inovio Pharmaceuticals, Inc. (NYSE Amex: INO) announced today that its next generation surface skin electroporation technology was successfully used to significantly enhance the delivery of small interfering RNA (siRNA) molecules to skin in animal studies. The data was published in the journal Molecular Therapy - Nucleic Acids in a paper entitled, "Optimized in vivo transfer of small interfering RNA targeting dermal tissue using in vivo surface electroporation." While Inovio has multiple ongoing human trials demonstrating the efficacy of its electroporation technology to deliver synthetic DNA-based vaccines to both skin and muscle, this is the first time that this technology has been applied to the delivery of siRNA molecules. Recently, siRNAs have demonstrated their potential as novel therapeutics due to their ability to induce robust, sequence specific gene silencing in cells. Using siRNA to induce RNA interference (RNAi) could become a promising therapeutic approach to treat many currently untreatable disorders, such as some cancers and many viral and genetic diseases. This preclinical study of Inovio's novel delivery method demonstrated positive results using its minimally invasive, low-voltage surface electroporation technology to successfully delivery siRNA to the skin. The primary point of this study was to establish whether electroporation is able to accomplish effective delivery of RNA in vivo. The successful outcome of this study highlights the far-reaching therapeutic potential for Inovio's electroporation technology. 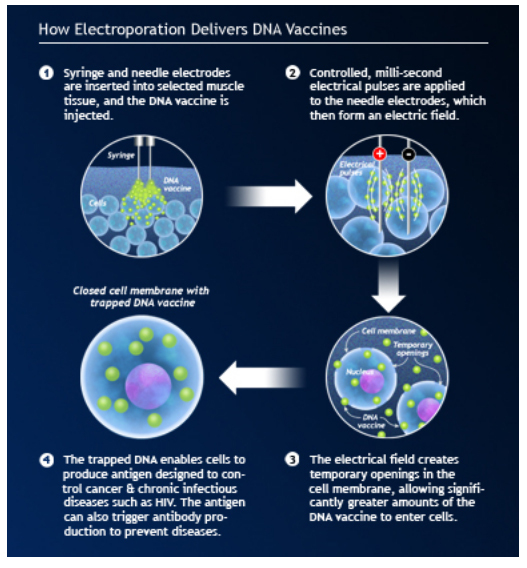 Preclinical and clinical studies have demonstrated that electroporation, as an effective physical delivery method, can improve both the expression and immunogenicity of DNA vaccines by up to 100-fold. Dr. J. Joseph Kim, President and CEO, said "Perhaps the biggest hurdle in realizing the full potential of RNA-based therapies is the lack of proper and efficient delivery of siRNA molecules. This study supports the idea that Inovio's proprietary electroporation technology can successfully deliver breakthrough RNA therapies with the same efficacy and safety in which we deliver DNA therapies. Most important, our delivery platform could pave the way for the development of targeted RNA-based therapies for diseases and conditions that are now considered untreatable." Researchers in this study investigated the optimization of electrical parameters for a novel low-voltage electroporation (EP) method to deliver RNA to dermal tissue in vivo. Initially, the electrical parameters were optimized for dermal delivery of plasmid DNA encoding green fluorescent protein (GFP) using this novel surface dermal EP device at as little as 10V voltage parameters. The device was also assessed for the electronic transfer of siRNA into dermal tissue and Inovio researchers observed robust transfection of tagged-siRNA in the skin. The researchers then assessed whether the successful transfer of siRNA led to gene knockdown (silencing) in vivo. Using a reporter gene construct encoding GFP and tagged siRNA targeting the GFP message, researchers demonstrated simultaneous transfection of the siRNA to the skin via EP and the concomitant knockdown of the reporter gene signal. The siRNA delivery was accomplished with no evidence of injection site inflammation or local tissue damage. The minimally invasive low-voltage EP method is able to efficiently deliver functional siRNA molecules to dermal tissue in a tolerable manner. In our cells, genes produce proteins that determine all body functions. Sometimes these genes produce proteins harmful to the body or cause improper protein accumulation or protein activity. The goal of gene silencing is to reduce or eliminate the production of select proteins that cause or serve the development of diseases at the RNA level. By interfering with protein production, siRNA and RNAi could potentially play a role in controlling or eliminating diseases such as cancers and infections. To achieve this goal, siRNA must be efficiently delivered into cells. Electroporation has a well-established track record of delivering useful drugs and biologics into cells to perform their useful function.